Posted on 29, August 2018 by EuropaWire PR Editors | This entry was posted in Automotive, Energy, Gas & Oil, Germany, Technology, Transportation & Logistics and tagged axle, Bosch, Dr. Markus Heyn, electrified, electrified axle, electrified_axle, electromobility, Hannover, IAA Commercial Vehicles, IAAMEsse, semitrailers. Bookmark the permalink. STUTTGART, 29-Aug-2018 — /EuropaWire/ — Bosch is electrifying semitrailers, and thus making electromobility possible for today’s semitrucks. At the IAA Commercial Vehicles in Hannover, Bosch will be presenting an electrified axle that can be integrated into semitrailers. The idea behind it is to integrate an electrical machine into the semitrailer’s axles, instead of simply allowing them to roll freely, as has been the case up to now. This means they can generate electricity during braking, and feed it into the trailer’s power units. In the case of a refrigerated trailer, the saving can be as much as 10,000 euros a year. 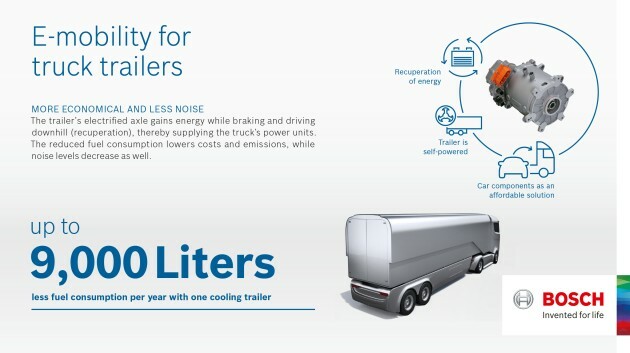 If the cooling unit is operated using the power generated in this way, Bosch calculates that it can save up to 9,000 liters of diesel a year. An electrical start and acceleration boost function can help save additional fuel. Any fuel saving also reduces CO2 emissions. One further advantage, especially for deliveries by urban supermarkets, is that electric cooling units make significantly less noise than diesel-powered ones. Deliveries can thus be made early in the morning or late in the evening without disturbing the neighbors.